Did accused attempted murderer commit vote fraud too? STORY UPDATED: SPOILER ALERT: The answer is “no,” but it helped the SBOE identify a website-display error in their programming. Updated after SBOE data wizard, Brian Neesby looked into it. The answer is “nope.” The Wake County BOE is not to blame. Mr. Avery-Kennedy had registered on two occasions and this triggers a data merging function that is then only supposed to display the latest, combined, record. Instead, it displayed both. There are other records that would show this problem too, so our Durham Patriot Warrior, Bart Goswick, deserves an award for finding this problem and alerting us to it! Dec 17, 2015 (RALEIGH) — Yesterday, Jaquan Avery-Kennedy was charged for attempted murder after a woman was found who had been shot in the neck in Raleigh, but the story got even more interesting when a VIP team member discovered that something was up with the perp’s voting record: According to the NC State Board of Election voter look-up page, it appears that he voted twice in the same election. Click the image and then click the “Voter History” block to see the latest SBOE status of this fine young voter. To be clear, we’re not accusing the man of committing the the heinous crime of double voting. He’s got enough trouble with attempted murder, anyway. 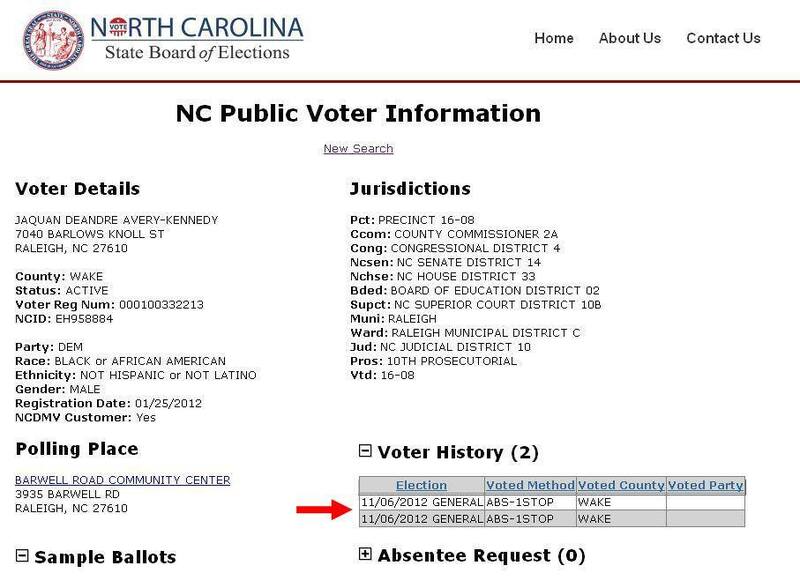 But this probable record-keeping error raised enough of an alarm in our circles that we put the question to Jackie Hyland, the brand new PIO at the NC State Board of Elections, who formerly reported for WRAL. Could our data system possibly be smart enough to detect and report vote fraud? And then…could Wake County BOE employees be dull enough to see it and do nothing about it?